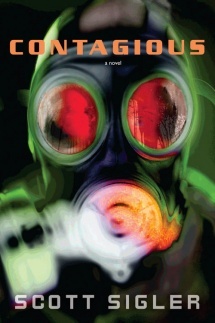 Contagious is a thriller / science fiction novel by American author Scott Sigler, and the sequel to Infected. It is the second book in the Infected Trilogy. As with previous novels, Scott Sigler has preceded the release of the hardcover novel with the podcast version of the novel. The first episode of the podcast version was released on December 7, 2008. These three and their team have kept humanity in the game, but that’s not good enough anymore, not when the disease turns contagious, triggering a fast countdown to Armageddon. Meanwhile, other enemies join the battle, and a new threat — one that comes from a most unexpected source — may ultimately prove the most dangerous of all. In a previous podcast, Sigler has mentioned that he has plot "advisors" including members of the U.S. armed services, a PHD candidate in Biology, and "someone who works with satellites" (whose actual job is apparently too sensitive to be revealed). He also stated that he is seeking an expert on quantum entanglement and communication. Infected has been translated into several languages. For a full listing, visit the Translations Page. 1st Ed. Hardcover United States December 30, 2008 Amazon.com U.S.
1st Ed. Paperback United States December 29, 2009 Amazon.com U.S.
A contest was held where the object was to design the patch used by the DOMREC team nicknamed The Exterminators. Scott Sigler announced the winner on November 5, 2008 in a congratulatory blog post. The winner was a junkie by the name of Jennifer Wills who can be found on the forums at scottsigler.com with the user name of cruzbabe63. Her winning design is pictured at right. Her winning submission earned her several prizes among which was a signed first-edition of Contagious in hardcover. Similar to the novel Nocturnal, author Scott Sigler’s novel Contagious includes randomly chosen fans who have characters named after them. The luckiest of these fans will also have their character die a horrific and untimely death as the novel progresses. The following list of names can be found on the Contagious Fan Character page. In his innovative style author Scott Sigler ran a unique promotional campaign on December 16, 2008. In order to generate awareness of the upcoming release of the horror novel Contagious, there were twelve unique promotional posters released, each hinting at a key phrase or plot point. If you put all twelve of these high-resolution, printable posters together in the right order, you can see Perry's final, doom-filled vision. Following the success of the Sigler Stank Tour to promote the release of the novel Infected, author Scott Sigler is taking to the road again to promote the release of the sequel Contagious. The following schedule is the confirmed tour dates and locations. The podcast version of Contagious used the song Perfect Day to Die by the band The Transfer. For a comprehensive list of music used in the podcast versions of Scott's works, refer to the Theme Music page. This page was last modified on 19 April 2018, at 19:04. This page has been accessed 25,594 times.